It’s time for an extremely stacked weekend in competitive gaming. The next couple days are going to be filled with matches in just about every competitive vocation you could imagine. Overwatch, Dota 2, League of Legends, Hearthstone, Counter-Strike, Rocket League, Smash Bros., Street Fighter... there is a Fate/Unlimited Codes tournament this weekend. Honestly, this just pumps me up. It wasn’t too many years ago that I stayed up until 4 a.m., face softly illuminated by the blue glow of a laptop, waiting for the night’s GSL StarCraft matches to start. That was esports then; now, it’s blockbuster weekends like this, with tournaments and stage playoffs, and a flood of matches. It’s pretty rad, y’all. So why wait any more? Here’s the list of everything that’s going down this weekend in the wide, wide world of esports. The league closes out week 5 and decides a stage 3 victor this weekend. First, Shanghai will try to avoid an 0-30 run against the London Spitfire at 4:00 p.m. ET, followed by Seoul vs. Houston and the Los Angeles Valiant playing the Philly Fusion. Then on Sunday, the playoffs get underway starting at 4:00 p.m. ET. 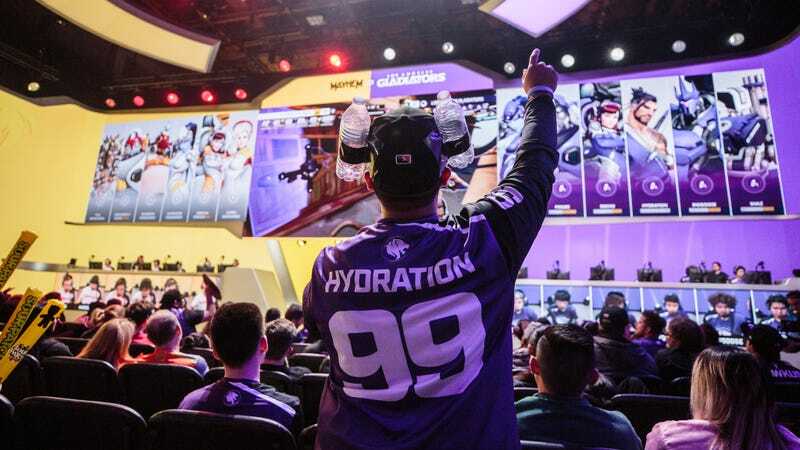 Find all the action on the Overwatch League Twitch channel. The Epicenter major wraps up this weekend, with today’s losers bracket matches and the winners bracket finals currently ongoing. Then on Sunday, finals kick off at 7:00 a.m. ET, with a losers bracket finals followed by a best-of-five grand finals. Will Virtus.Pro surge back for another major? Or is it Liquid’s turn, or maybe the freshly sponsored PSG.LGD? Find out over at the Epicenter Twitch channel. The 2018 midseason invitational is underway, and teams from across the world have congregated in Berlin to test one another’s mettle. This weekend, it’s the play-in group stages, where squads from regions like South America, Japan, and Turkey compete to play against the major LCS teams. Games are currently underway today, but if you miss them, you can find the VODs over on the Riot Games Twitch archives. The European playoffs for the 2018 Hearthstone championship tour season 1 are going on today—these summer playoffs lead into a championship later on, but first each region must determine its champion. Games are already underway this morning, but if you miss them, head over to the Twitch archives to catch up. Fingers crossed for no Cubelocks. The sixth Smash Summit heads into its second day today. The fun brackets are resolved, and now its time for some good ol’ fashioned Melee singles and doubles. This event is packed to the brim with Melee’s finest, and any Summit tournament tends to be a blast no matter what. Tune in when matches start later today at 12:30 p.m. on Beyond the Summit’s Twitch channel. There’s a flood down in Texas... of fighting game players looking to secure some more Capcom Pro Tour points in Houston’s big fighting game tournament. (As an Austinite, I get a free pass on the bad SRV puns.) Alongside some Street Fighter V action, you can also catch Tekken, Dragon Ball FighterZ, Guilty Gear, even Street Fighter II: Super Turbo Arcade. Head over to the Smash.gg page for info on the many streams and schedules. Also known as KVO x TSB, this major Japanese fighting game tournament features some games you do know, and probably a few you don’t. Alongside Dragon Ball FighterZ and Smash 4, there’s Chaos Code, some Dead or Alive 5, and even the Fate fighting game Unlimited Codes. English broadcast matches get underway tonight at 9 p.m. ET on the AnimeIlluminati Twitch channel. IEM Sydney wraps up its grand finals quite late at night for the stateside fans. FaZe and Astralis hash it out starting at 1:00 a.m. ET, but as always, you can find the weekend’s matches stored away in the VOD archive on the ESL CS:GO Twitch channel. The promotion tournament for the Rocket League championship series kicks (bumps?) off in North America today at 3:00 p.m. ET, as teams look to make the cut for the big leagues. Looking for Europe? They play tomorrow, starting at 12:00 p.m. ET. Find it all over at the Rocket League Twitch channel. The 2K league’s tip-off tournament is going on now, and teams are definitely playing that virtual basketball. The playoffs get going at 1 p.m. ET with the Cavs against the Jazz, followed by Blazers and the Pacers, Warriors v. Pistons, and finally the Mavs and the 76ers. See it all on the 2K league’s Twitch channel. The inaugural season of the Battlerite pro league is up and running, and three-man squads are looking to make their mark in the battle arena brawler. If you’ve never seen some pro Battlerite before, you should check it out. The games start at 3:00 p.m. ET today over on the Battlerite Twitch channel. The qualifier crucible for the Heroes global championship kicks off this weekend, where open bracket teams will try to nab a spot in the major leagues. Matches get underway with LFM Esports taking on... xD. At 3:00 p.m. ET. Hard not to root for a team name like that. Find it all over at the Heroes of the Storm Twitch channel. Did we miss anything? Any locals you want to shout out? Are you the one true hero who read all the way to the end of this post? Let me know in the comments!